When I’m at home and I want to chart a knitting stitch, I use my professional quality software, StitchMastery, which is excellent. I highly recommend it. But sometimes I’m out and about with my iPad and just want to sketch up a chart to work from and be able to edit. I’ve tried several of the charting apps. I would avoid Knitting Chart Maker. There’s a couple of others that are fine, though not good for professional publication, that I would recommend for those who don’t feel comfortable just doodling on graph paper or using a knitting font in a spreadsheet. Knit Designer is good for project planning as well as charting. Knitting iCharts is a good, basic chart app. And PatternCraft is good for designing colorwork. Speaking of knitting fonts – there’s an app that can be used to install new system fonts on iPads – it’s named AnyFont, and I’ve been using it quite happily. For those who would like to use a knitting font with a spreadsheet app, it solves the problem nicely. It’s also good if you want to use Pages for writing your patterns for publication but want to use fonts that aren’t included in iOS. But truthfully, there are times when I prefer using a graph paper notebook and pencil. Except that I don’t really want to carry that around with me if I’ve already got my tablet. It turns out that there are several good substitutes here. One possibility is to use GoodReader‘s PDF annotation options combined with free graph paper PDFs. (GoodReader is an excellent file storage app, even if you don’t use the annotation functions. Well worth it.) 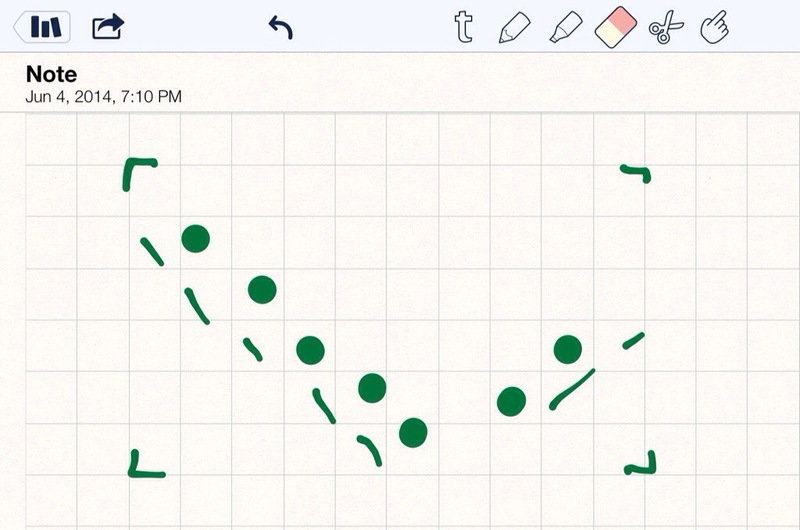 There are also various apps for taking notes by hand that will let you use a graph paper background. I was using Penultimate for a while until they were absorbed into the Evernote ecosystem. I don’t really have anything specific against Evernote – it just doesn’t fit my workflow somehow. Anyway, Penultimate’s an option, especially if you like Evernote. But I’m currently using Notability and really, really like it. I can set a graph paper background as the default, and sketch charts. I can erase a whole symbol with one touch of the eraser. I can type notes to myself on the side. It works with my brain. I use some shortcuts in the process – I set the brush size to a large solid circle when I want to make yarn overs, and just tap once in the squares that the YOs go – it’s quick and easy, even if it doesn’t match the symbol I’ll use in the final chart. StitchSketch is a nice, fairly versatile chart-maker. It’s library of knitting stitches is limited, but it’s fast and easy to draw out your ideas and then move them into another more advanced program later. I also love Notability for a huge range of uses and recommend it to anyone that asks! StitchSketch does look useful; downloading the free trial now. Thanks!